U.S. Defense Secretary Ash Carter visited a U.S. aircraft carrier in the South China Sea Thursday, and largely blamed China's maritime expansion for increasing tensions in the region. Carter was traveling with his Malaysian counterpart, Hishammuddin Hussein. 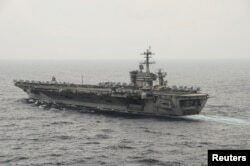 The two boarded the U.S. aircraft carrier USS Theodore Roosevelt as it sailed the South China Sea off the coast of Malaysia. "If it's being noted today in a special way, it's because of the tension in this part of the world, mostly arising from disputes over land features in the South China Sea, and most of the activity over the last year being perpetrated by China," Carter told reporters when asked about the significance of his visit. In announcing his visit on Wednesday, Carter said it is a "symbol of our commitment" to the region and to focusing more U.S. attention on the Asian-Pacific nations after years of focus on the Middle East. Carter and Hussein are observing the aircraft carrier's fighter jet operations and are being briefed by Navy officers on recent maneuvers. The aircraft carrier USS Theodore Roosevelt (CVN 71) transits the South China Sea in this U.S. Navy picture taken Oct. 29, 2015. U.S. Secretary of Defense Ash Carter will visit the Roosevelt as it transits the South China Sea on Thursday. The brief cruise by Carter and Hussein takes place days after a U.S. guided missile destroyer sailed within 22 kilometers of the Subi Reef in the Spratly Island archipelago. 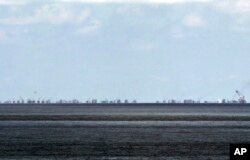 Beijing launched a massive building project last year to transform the submerged reefs into islands that can support runways and other facilities, ignoring competing claims to the outcroppings by the Philippines, Vietnam, Taiwan and other Asian nations. The Obama administration says the warship's passage was a routine exercise aimed at protecting the open navigation of the seas. The dispute overshadowed Wednesday's meeting in Kuala Lumpur of ASEAN defense ministers, plus Carter and his counterparts from China, Australia, India and Japan. The ministers failed to issue a traditional joint statement at the end of the forum, after China lobbied to block any mention of the contentious South China Sea. "I had no expectation that everyone would agree on the South China Sea or any other issue," Carter said. "That's the reason for this forum is to discuss these issues, so I had no expectation with the agreement there. With respect to the joint statement, that is something that ASEAN members discuss," he added. "Obviously they weren't able to reach consensus, and that reflects I think the level of concern that was reflected in the conversation about activities in the South China Sea." China's Defense Ministry said it regretted a joint declaration was not issued, and accused "certain countries" outside of Southeast Asia of being responsible for the cancellation of a statement. The U.S. has called on China to stop building in the South China Sea, characterizing the activity as destabilizing for the region. Chinese officials have defended the construction as a peaceful effort meant to aid shipping through the disputed waterway.